This modest utilitarian building was completed in 1955 to serve as the clubhouse for the Woodland Park Lawn Bowling Club. In 1899, the Parks Department acquired the 180-acre Woodland Park from the estate of Guy C. Phinney, a wealthy lumber mill owner and real estate developer. In the late 1880s, Phinney paid $10,000 for 342 acres of land along what we now call Phinney Ridge and down the slope to Green Lake and kept more than half of it for himself. He then spent $40,000 converting his land into an elegant English-style estate named Woodland Park, complete with formal gardens, and generously opened his estate to the public as long as they obeyed his conspicuously posted rules. Since the location was considered far from the center of town, Phinney also installed a streetcar line down the hill to the town of Fremont. Phinney’s untimely death in 1893 at the age of 41 left his estate unfinished. Six years later, his widow sold the property to the city despite significant controversy over the $100,000 asking price and the distant location, and opposition by Mayor Thomas J. Humes. In 1903, the city hired the Olmsted Brothers landscape firm to prepare plans for a comprehensive park and boulevard system, including suggestions for improvements to existing parks. This move was largely brought on by the public interest generated for the planned Alaska-Yukon-Pacific Exposition and through the purchase of Woodland Park and the acquisition of Washington Park, two large tracts of mostly undeveloped land. A general plan for the landscape development of Woodland Park was included in the initial report prepared by the firm, but a more detailed plan with 65 drawings was not completed until 1910. Within four years, the park had been almost entirely reconstructed following the detailed plans of the Olmsted Brothers, which incorporated many of the existing features. These plans included a zoological garden for the upper area of Woodland Park and athletic fields and a picnic grove for the lower eastern half. Over the years, additional facilities and amenities were added in various portions of the park. 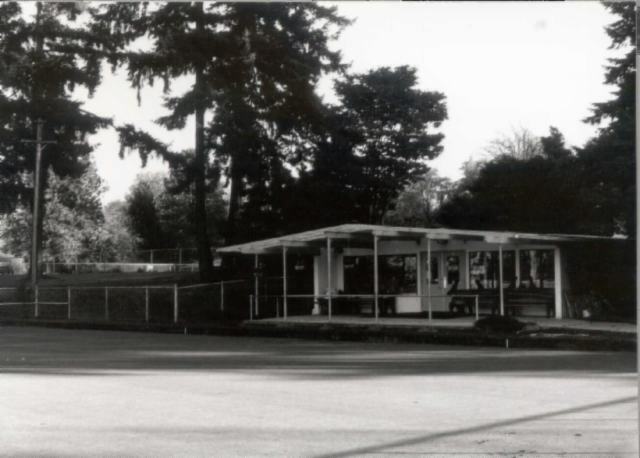 In 1932, the Parks Department established a lawn bowling green at the northern end of the park on a low bluff overlooking Green Lake to meet the growing local popularity for the game. Twelve years later, the Parks Department developed a second lawn bowling green located at Jefferson Park. In 1915, the American Lawn Bowling Association had been formed to promote the game, and the American Institute of Park Executives later endorsed the construction of municipally funded facilities. For the first two years, the Recreation Staff from the Parks Department operated the green before entering into an annual contract with the Queen City Lawn Bowling Club. After 1939, the Club operated it under a concession agreement with the Parks Department. In 1955, the Parks Department constructed this concrete block clubhouse building on the south side of the green to replace the shed used for office and storage space. By the early 1960s, the increasing popularity of the facility led to the development of a second green in 1962. This building is significant for its association with the development of Woodland Park and the sport of lawn bowling in Seattle. Completed in 1955, this concrete block clubhouse occupies a site immediately south of one bowling green and west of another at the northern end of Lower Woodland Park. Clubhouse facilities occupy the northern half of the building, while public restrooms occupy the southern half. A low-pitch front gable roof with deep overhangs on all elevations covers the irregular footprint of this one-story structure. On the principal north elevation facing the bowling green, the concrete block side walls extend beyond the façade, creating a recessed area extending the length of the elevation. Metal posts at the edge of a wide concrete patio support six overhanging roof trusses with decorative ends. The recessed wall on the north elevation has double entrance doors centered between four large window openings set with modern metal sash sliders. The east and west elevations contain projecting bays of different sizes near the centers of the otherwise blank concrete block walls. Heavy landscaping obscures much of these longer side elevations. On the rear south elevation, the side walls also extend beyond the façade. Four large roof trusses overhang the recessed area across the length of the elevation. The entrances to the restrooms are located at either end of the elevation and are screened by walls of vertical board set between metal posts. Modern metal gates have replaced the original single entrance doors. The wide door at the center of the elevation provides access to a maintenance room. Despite the window alterations, this modest building retains fairly good physical integrity. Sherwood, Don. Seattle Parks Histories, c. 1970-1981, unpublished. The History of the Zoo, Woodland Park Zoo Website (http://www.zoo.org/zoo_info/special/history/begin.htm).